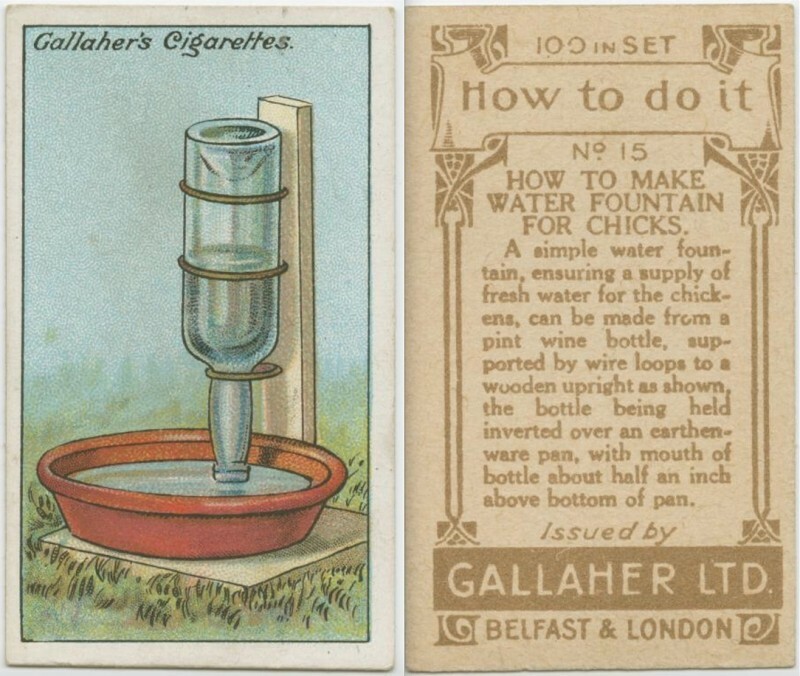 These 18 tricks are ancient but when you see what kind of brilliant ideas the people had back then? Wow! 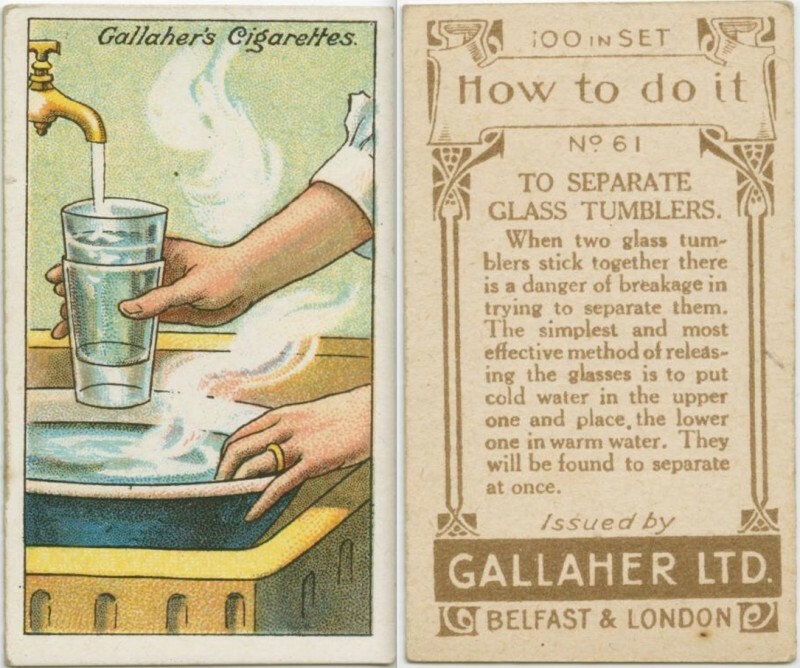 In the early 20th century, the cigarette company Gallaher's published 100 "How to do it" cards. They featured some conventional tricks from everyday life in 1910. A family member, George Arents (1916-199) collected them all and donated them to a library which digitalized them. It's fascinating how helpful many of these are even 100 years later - and how stranger others seem from our contemporary perspective! 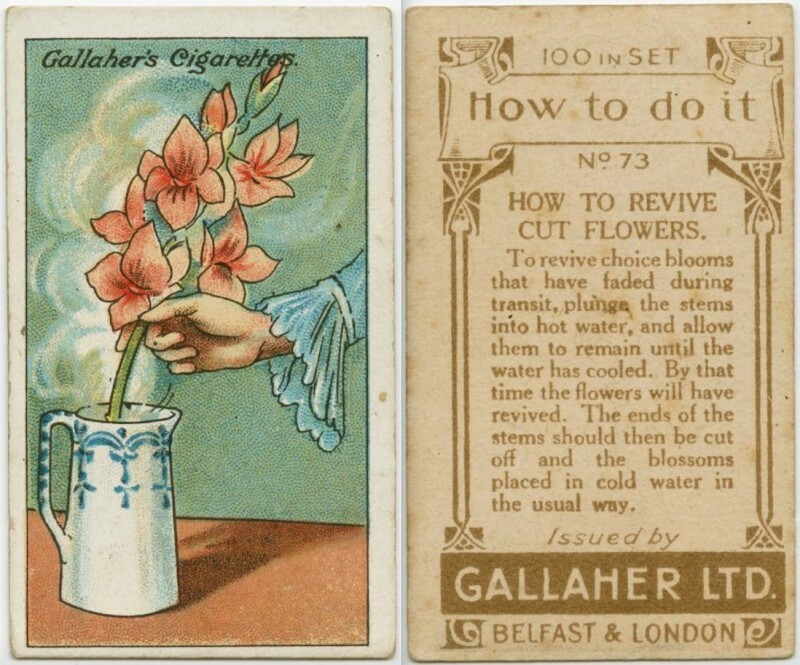 How to revive some cut flowers"To revive choice blooms that have faded during transit, plunge the stems into hot water, and allow them to remain until the water has cooled. By that time the flowers will have revived. The ends of the stems should then be cut off and the blossoms placed in cold water in the usual way." How to clean bottlesTo clean the interior of bottles, a little sand and water should be well shaken inside them. This will have the effect of cleansing every part, and the bottles can be washed out and dried. 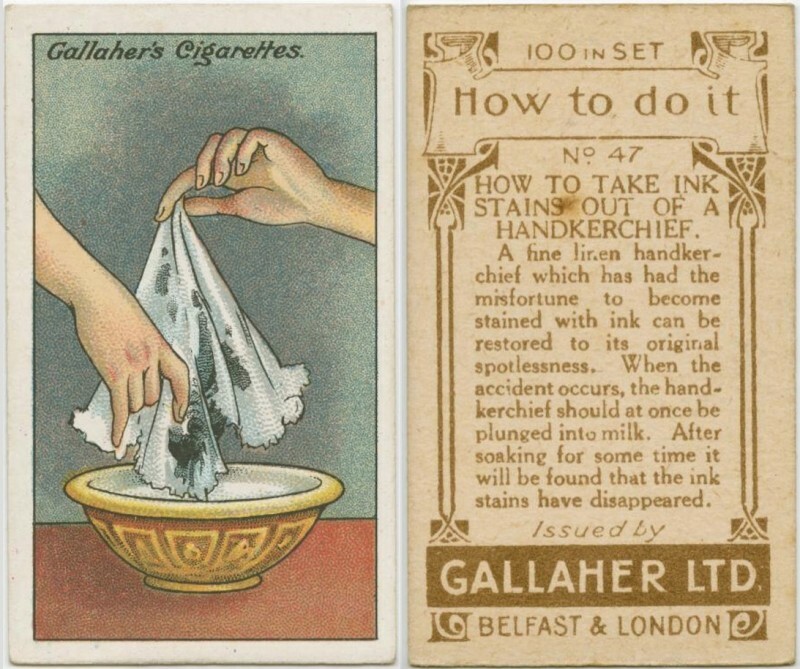 How to take ink stains out of a handkerchief A fine linen handkerchief which has had the misfortune to become stained with ink can be restored to its original spotlessness. When the accident occurs, the handkerchief should at once be plunged into milk. After soaking for some time it will be found that the ink stains have disappeared. 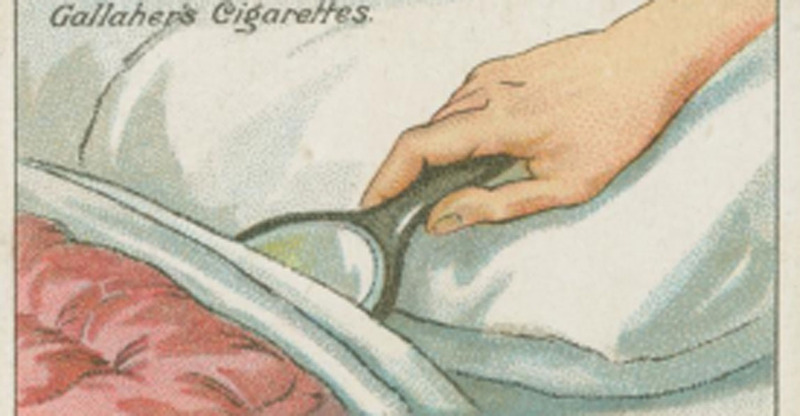 How to detect dampness in bedsIn order to detect dampness in a strange bed and so be warned of the danger, a small handmirror should be slipped between the sheets and left for a few minutes. Any mistiness or blurred appearance of the mirror's surface when withdrawn is an indication of dampness and the bed should not be slept in. 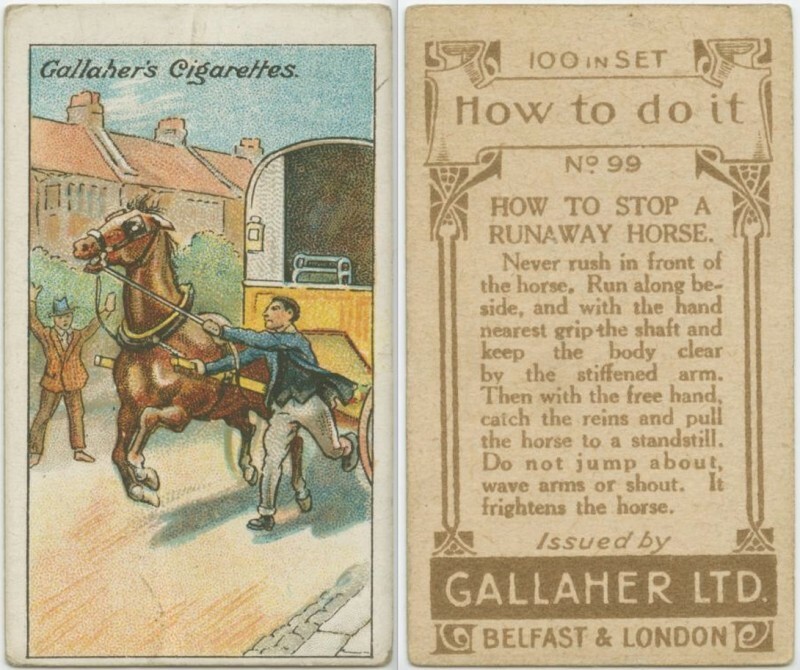 How to stop a runaway horse. Never rush in front of the horse. Run along beside, and with the hand nearest grip the shaft and keep the body clear by the stiffened arm. Then with the free hand, catch the reins and pull the horse to a standstill. Do not jump about, wave arms or shout. It frightens the horse. When boiling cracked eggsTo boil cracked eggs as satisfactorily as though they were undamaged, a little vinegar should be added to the water. If this is done, it will be found that none of the contents will boil out. 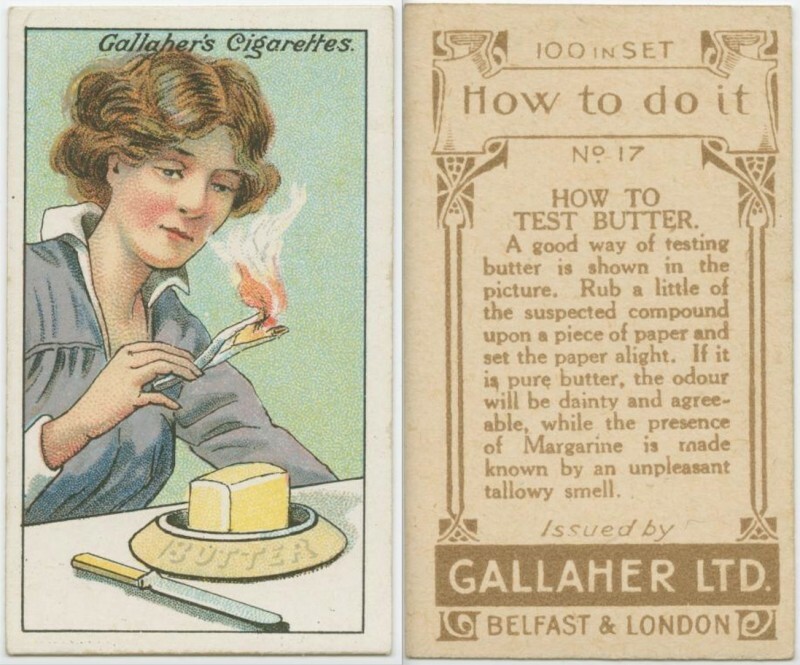 How to test butterA good way of testing butter is shown in the picture. Rub a little of the suspected compound upon a piece of paper and set the paper alight. If it is pure butter, the odour will be dainty and agreeable, while the presence of Margarine is made known by an unpleasant tallowy smell. How to remove a splinterA splinter embedded in the hand is often very painful to extract. A good way to accomplish this is to fill a wide-mouthed bottle with hot water nearly to the brim, and press affected part of the hand tightly against mouth of bottle. The suction will pull down the flesh and steam will soon draw out the splinter. How to treat sprains Elevate the injured joint and wrap in cloths wrung out in cold water. The picture shows how to keep the cloths constantly wet without having to change them. 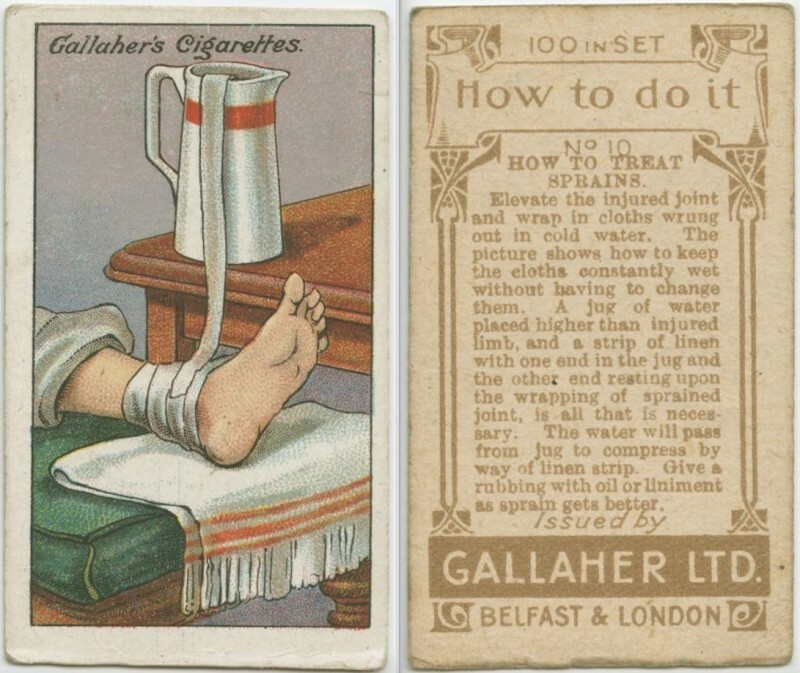 A jug of water placed higher than injured limb, and a strip of linen with one end in the jug and the other end resting upon the wrapping of sprained joint, is all that is necessary. The water will pass from jug to compress by way of linen strip. Olive & rubbing with oil or liniment as sprain gets better. How to carry a heavy jugThe picture gives a useful hint on carrying a heavy jug. The correct way to hold the jug is shown in the right-hand sketch. This prevents the weight from pulling the jug down and so spilling what it contains, as is likely to happen if carried the other way. How to separate glass tumblersWhen two glass tumblers stick together there is a danger of breakage in trying to separate them. The simplest and msot effective method of releasing the glasses is to put cold water in the upper one and place the lwer one in warm water. They will be found to separate at once. How to light a match in the windThe familiar difficulty of lighting a match in wind can be to a great extent overcome if thin shavings are first cut on the match towards its striking end, as shown in the picture. On lighting the match, the curled strips catch fire at once - the flame is stronger and has a better chance. A hint when boiling potatoesTo make potatoes dry and floury when cooked, add to water when boiling them a pinch of sugar as well as salt. 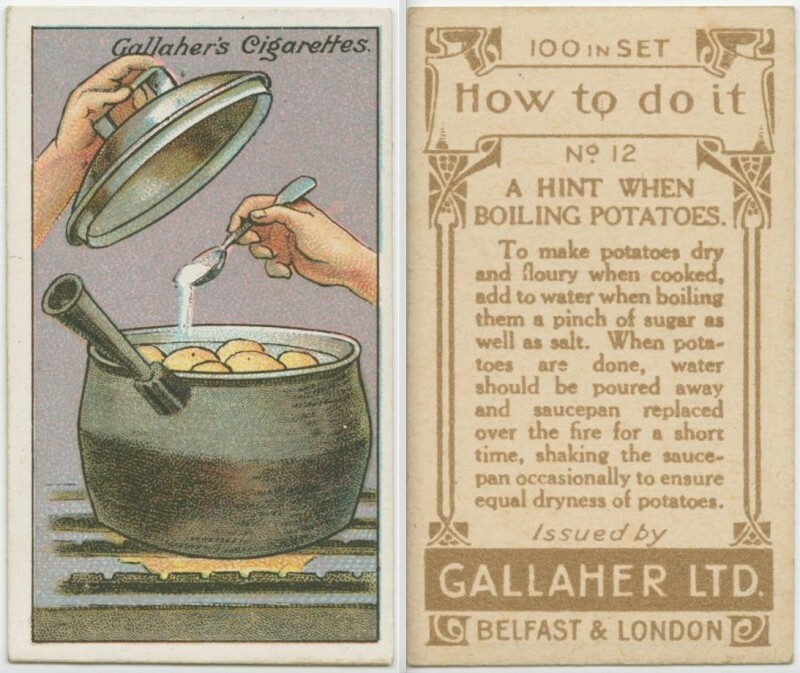 When potatoes are done, water should be poured away and saucepan replaced over the fire for a short time, shaking the saucepan occassionally to ensure equal dryness of potatoes. How to cut new bread into thin slicesThe difficulty of cutting new bread into thin slices can readily be overcome by the following expedient. Plunge the bread knife into hot water and when thoroughly hot wipe quickly. It will be found that the heated knife will cut soft, yielding new bread into the thinnest slices. How to make water fountain for chicks A simple water fountain, ensuring a supply of fresh water for the chickens, can be made from a pint wine bottle, supported by wire loops to a wooden upright as shown, th ebottle being held inverted over an earthenware pan, with mouth of bottle about half an inch above bottom of pan. How to judge the freshness of a lobsterIf, when buying a boiled lobster, you are in doubt as to its freshness, just pull back the tail, then suddenly release it: if the tail flies back with a snap, the lobster is quite fresh; but if it goes back slowly, you may be pretty sure the lobster has been boiled and kept for some days. 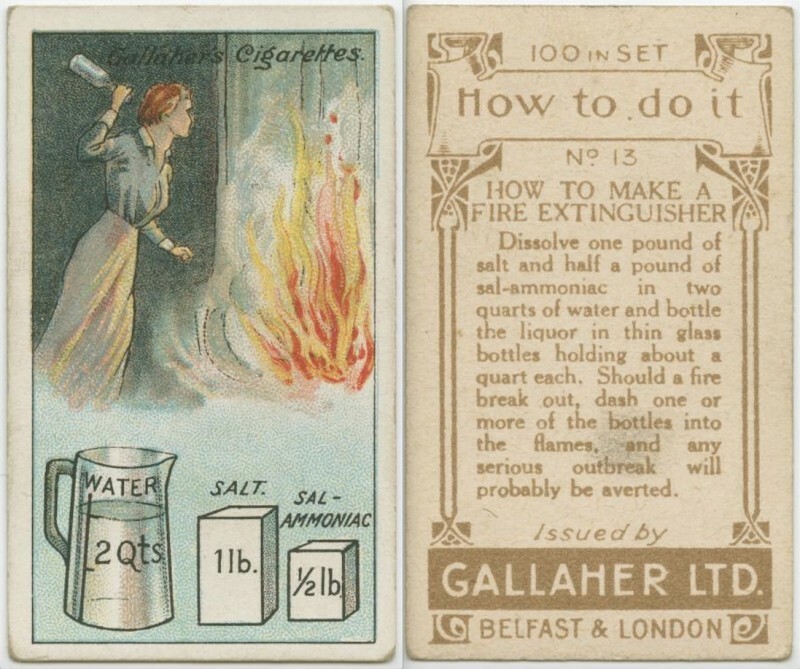 How to make a fire extinguisherDissolve one pound of salt and half a pounf of sal-ammoniac in two quarts of water and bottle the liquor in thin glass bottles hiolding about a quart each. Should a fire break out, dash one or more of the bottles into the flames, and any serious outbreak will probably be averted. How to preserve valuable vasesIf the following precaution is taken, the danger of knocking over a valuable vase will not be so great. 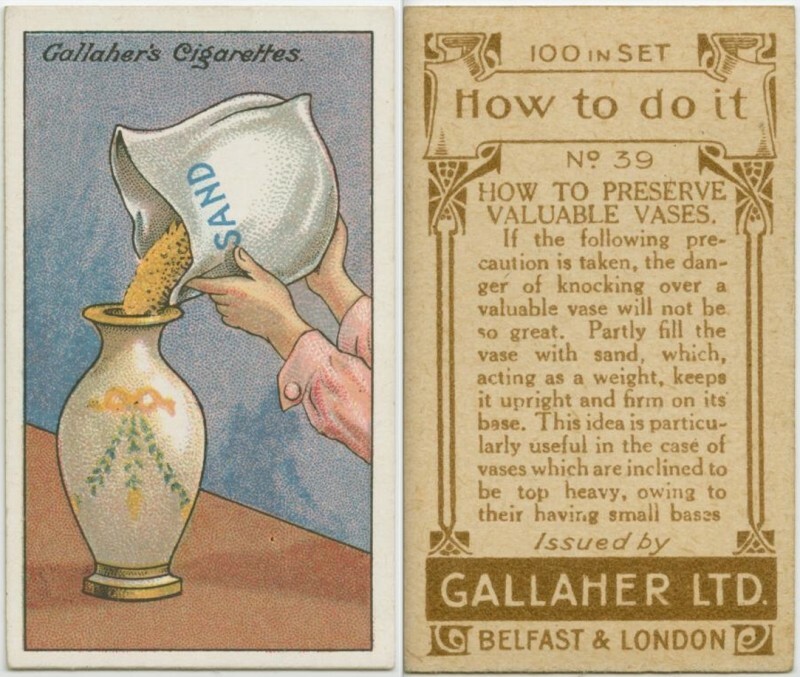 Partly fill the vase with sand, which, acting as a weight, keeps it upright and firm on its base. This idea is particularly useful in the case of vases which are inclined to be top heavy, owing to their having small bases. Hard to believe that these tricks are already 100 years old. When these ancient, but brilliant tricks also fascinated you, then SHARE this wonderful trip through time with everyone that you know!